7-color meter light and channel display. Large round meter that is easy to read. Advanced NB/ANL Circuit Reduces Interference. Automatic AWI (Antenna Warning Indicator) alerts the operator if their SWR’s are too high. Multiple step dimmer button on front panel. Front microphone connector for easy mounting in tight spaces. Receive and Microphone gain controls. Frequency Counter Jack pre-wired for FC-390 style counters. Please see the logo above for quick links to all our policies and general information. 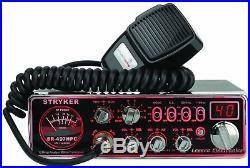 The item “STRYKER SR497HPC 110 WATT 10 METER RADIO WITH 7 COLOR SELECTABLE FACEPLATE” is in sale since Tuesday, January 23, 2018. This item is in the category “Consumer Electronics\Radio Communication\Ham, Amateur Radio\Ham Radio Transceivers”. The seller is “martinhod” and is located in Ponte Vedra, Florida. This item can be shipped worldwide.